I am happy to see our beloved brother Abraha Desta, our hero and our human rights defenders release from TPLF/EPRDF prison. I am so glad to see him with his family and friends. Brother Abraha is one of the few individuals who took a strong stand for the values of justice for all Ethiopian people. Brother Abraha gave up his privileged for the truth and justice, unity, equality, peace and freedom for all Ethiopian people. He is one of the few individuals from our Tigrayans brothers and sisters who spoken up against the TPLF and said not in my name or not in name of my ethnic group. He is a role model who spoke up against injustices committed by the TPLF. He spoken out against all injustice, both large and small. He use his position to speak out against social injustice, poverty and the torture under the TPLF/EPRDF. Anyone who says that Tigrayans, not all, but many, have not benefited under the TPLF/EPRDF regime, are lying to themselves. We all know that the key positions in the TPLF/EPRDF government, in the military, in the economy, in the judicial system, on the national election board, in banking and finance, in education and in any other sector of society are mostly held by Tigrayans who are loyal to the TPLF. For the most part, those from other ethnic groups are given certain positions by the TPLF only to fool the outsiders so they can look better. We also know that there has been more development, services and opportunity of every kind in the Tigrayan region and available to persons of Tigrayan ethnicity than in any other region or to any other group of Ethiopians. Brother Abraha is one of the few Tigrayans brother with such characters to actually acknowledge the fact that today the TPLF dominate the key government and private sectors in Ethiopia. He is a true symbol of the people. That is why he my hero and my leader. 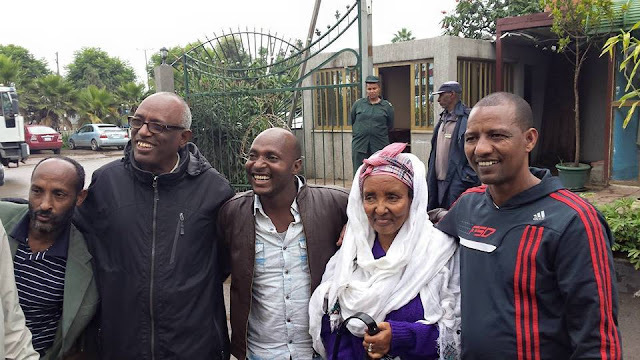 I am rejoicing to see him released from smaller prison to join his bigger family of Ethiopia in the biggest prison of the TPLF/EPRDF called Ethiopia. I am not ready to celebrate his releases yet because it is only one battle in a war for justice, freedom for all, peace and liberty throughout Ethiopia. Until tens of thousands of other Ethiopian political prisoners from every ethnic and religious groups who continue to languish in the prisons of Afar; Amhara; Benishangul; Dire Dawa; Gambella; Harari; Oromiya; Ogaden; Southern Nations, Addis Ababa; and Tigray are free, we are not free as a people and our victory cannot be claimed. Until all our Ethiopian institutions, now being used against us instruments of repression, are released from the tight controls of the ethnic aparthide regime of the TPLF/EPRDF, we can take hope and encouragement from this unexpected achievement, but it is only the beginning. Until Ethiopians can live, breathe and move freely about within our society—without fear of reprisals for simply thinking for ourselves—we are not free!